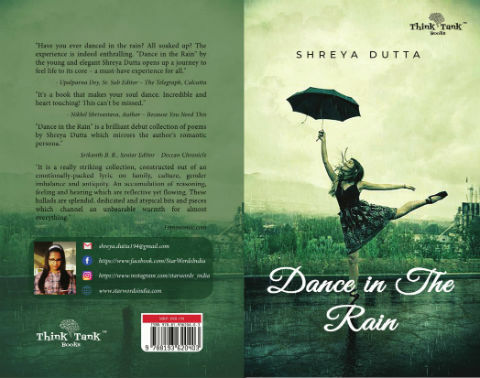 From our team, I got a chance to read two books by Shreya Dutta, both are poem collections, named Dance in the Rain and Melodies of Spring: Volume – 1. Both the books (EBook) are provided by the author herself to share our genuine and unbiased views and reviews for the same. And here are the same for “Dance In The Rain”. A carefree young girl, dancing her heart out in the rain, simply allowing to let go her black umbrella and let the rain enjoy her company; in a greenish background; the cover page is not less poetic I must say :). The cover page is really attractive. Well, for poems and poetries, everyone has his/her own choices. And, it is quite possible that a poem considered as a masterpiece by one, can be a set of lines written flatly for the other. So, it depends upon one’s likes, choices and taste. This book is a collection of 34 poems with the print length of 47 pages. A typical reader may find the book quite costly too. It is obvious to compare the price with the number of pages available in the book and thus coming to that conclusion. However, if you have the taste of reading poems and exploring the feelings through it, you will find this book interesting. Here are two obvious lines, I would like to quote from the book, which could have been the reason for writing this book and naming it “Dancing in the rain”. Has never enjoyed the dance in the rain. The way Shreya talks about two opposite things in a single set of lines, is interesting. And the way, the social networking and Internet connectivity has influenced our lives, is also mentioned in one of the poem! And here are the feelings which most of the human beings feel at least once in his/her life. But, it is better to be ourselves, rather than pretending to be anyone else, what do you say? So, by now, you should have got the idea about the quality and kind of writing you can expect in the book. As said earlier, it is strictly for the poem lovers. You will find shades of love and sadness both in the lines of this book. There are places where the author tries being realistic or explanatory rather than being poetic, and it may make some readers to like/dislike the poem(s) more. Some, may found the poems related to their own state of mind or can connect it with some of the past experiences. But, the experience will be different for different readers. Overall a nice collection of poems which is little costly. If you have passion for poems and poetry, you will enjoy reading it.